Digital direct print saves time, cost and labor. A long-awaited unit for color-proofing, sample preparation, position confirmation and presentation of mold image. 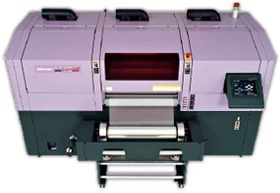 You can not only confirm the color and position, but also save time and cost greatly compared to the conventional way. Moreover, since it can print directly on soft packaging films, the final products can be simulated such as confirmation of bag shape before engraving of the cylinder.